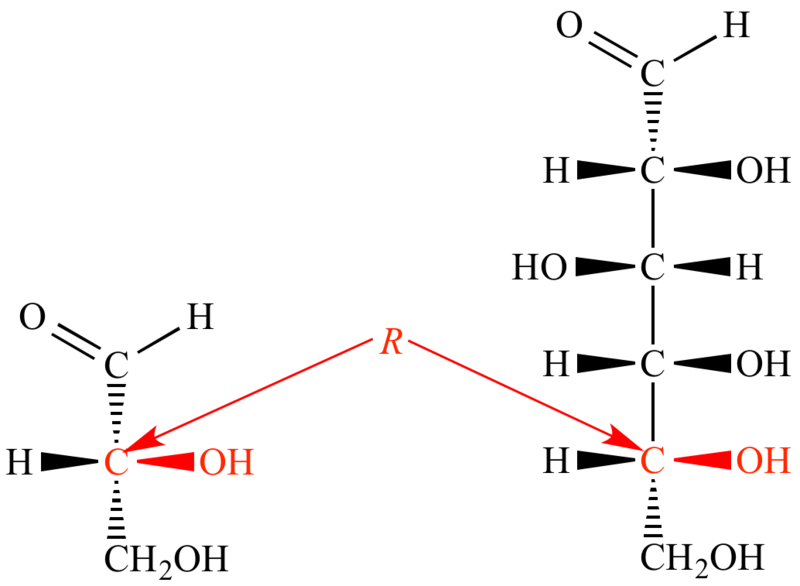 D: (1) A carbohydrate having the same stereocenter absolute configuration at the second-to-last carbon in its chain (in acyclic form) as (R)-glyceraldehyde (also called D-glyceraldehyde). Note that when 'D' is used to denote carbohydrate configuration, it is of a smaller font than the name of the carbohydrate. When an acyclic carbohydrate structure is drawn vertically (as shown below), with the carbonyl group as close to the top as possible, the carbohydrate's configuration is D when the OH group of the highest numbered stereocenter points to the right. (2) An α-amino acid having the absolute configuration shown below. Called D because this amino acid enantiomer can (in principle) be synthesized from D-glyceraldehyde. (3) The chemical symbol for 2H, the hydrogen isotope called deuterium. For example, D-Cl is 2H-Cl.